Sarah Nader- snader@shawmedia.com The Cardoso family, Leticia, Hugo and their children, Hugo Jr, 10, and Grecia, 13, take a photo outside their house during their house kick-off ceremony in McHenry Sunday, June 1, 2014. The Cardoso family is receiving a home through Habitat for Humanity of McHenry County that was donated by Bank of America. Work begins on the house this Friday. This is the third house this year and 27th overall that Habitat for Humanity of McHenry County has worked on. 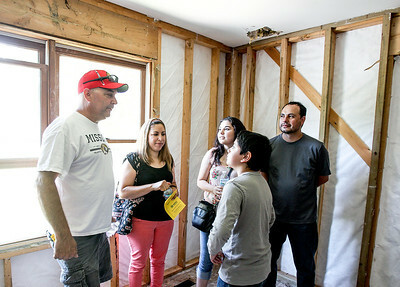 Sarah Nader- snader@shawmedia.com Bill Weber (left) with family support committee, talks with The Cardoso family, Leticia, Hugo and their children Grecia, 13, and Hugo Jr., 10, during their house kick-off ceremony in McHenry Sunday, June 1, 2014. The Cardoso family is receiving a home through Habitat for Humanity of McHenry County that was donated by Bank of America. Work begins on the house this Friday. This is the third house this year and 27th overall that Habitat for Humanity of McHenry County has worked on. 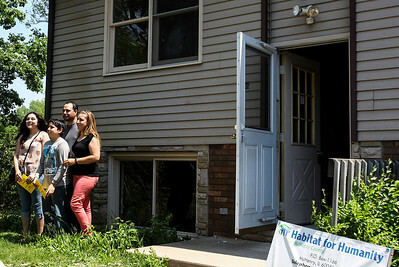 The Cardoso family, Leticia, Hugo and their children, Hugo Jr, 10, and Grecia, 13, take a photo outside their house during their house kick-off ceremony in McHenry Sunday, June 1, 2014. The Cardoso family is receiving a home through Habitat for Humanity of McHenry County that was donated by Bank of America. Work begins on the house this Friday. This is the third house this year and 27th overall that Habitat for Humanity of McHenry County has worked on.